Copper engraving later hand colour. Overall size in off white fully conservation grade mount and backing: 45cms.x 35.2cms. Image size : 330mm.x 225mm. 3scales of distance, faint unobtrusive crease where once folded ; very good condition. As Royal Hydrographer, Bonne's main concern was the production of marine charts but he was also involved in other works. 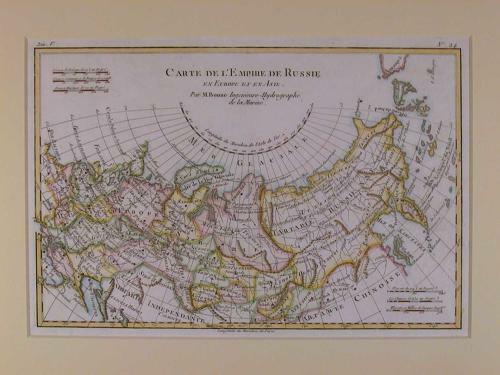 He supplied maps for an atlas by Guillaume Raynal and for an Historical Atlas and Encyclopedia which was published in association with Nicholas Desmaret.